Having had some quite disturbing nail art on yesterday, I wanted something much cuter to look at so I chose to base this day's nail design on a VERY cute owl tutorial by cutepolish! How cute are these?! 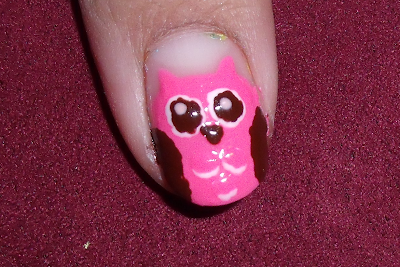 Decided to spice things up with an owl on each nail rather than just the one like cutepolish. I'm also a big big fan of colour so went for different colours too!